Irish or Scottish Red Tartan Plaid Lanyards with Cool Red Tartan Plaid, Kilt or Scotland Highlander Themes. The Scottish or Irish style red tartan or tartan plaid lanyards come with pre-printed red color plaid patterns. Tartan derive from the Irish "tarsna" ("crosswise") or Scottish Gaelic "Tarsuinn", meaning "across". Tartan has become a symbol of Scottish Culture. It is most notably worn as the kilt, plaids, or other Highland Dress, but the arts of tartan are widely used in a variety of products. Standard hardware attachments for red plaid or tartan lanyards are available in heavy duty nickel color swivel hooks, badge clips, key rings, or cell phone connectors at the same cost. They can be worn as red tartan plaid neck lanyards or red tartan plaid wrist lanyards. Red tartan plaid lanyards also come with a variety of optional hardware attachments, such as safety break-away buckles, heavy duty nickel color, gold, antique brass or black nickel color snap hooks. Any of the pre-printed red plaid lanyards are in stock, can be ordered at as small quantity as 2 pieces and can be shipped right away. They are good for personal use, Scottish gift shops or stores, resellers, wholesalers, distributors, event fundraising or promotional giveaway gifts. Please check our online catalogs for more red tartan plaid, kilt or Scotland Highlander theme lanyard supplies. The tartan plaid, kilt or highlander lanyards are widely used on Irish dance competition teams, like folk dance, step dance or river dance members' ID name badge holders. A variety of tartan plaid, kilt or Scotland highland color patterns or arts are used for homemade gift wraps, crafts, clothing, handbags, purses, gifts, towels, belts, dancing skirts, blankets, pajamas, rugs, highlander wear, traditional tartan kilts, kilt outfits, jackets, clans, watches and more. Specifications: Scottish or Irish Red Tartan Lanyards with Cool Red Tartan Plaid, Kilt or Scotland Highlander Themes - Tartan Supplies. A Great Lanyard Source For Scotland or Irish Dancing, Tartan Stores or Plaid Gift Shops. 1. Standard Width of Red Tartan Plaid Lanyards: 5/8". 4. Standard Colors of Webbing/Straps: In stock: black, royal red and red colors. Optional color: navy blue, white, red, yellow, orange, grey, burgundy, dark green, light green, purple and teal colors - minimum order 100 pieces. Special Pantone PMS colors with a minimum order of 5000 pieces or more. 7. Plain, Blank, Non-Imprinted Models: In stock: black, red and royal red colors with any custom length - can be shipped right away. 8. Pre-Printed Models: In Stock: Dye-Sublimated Multi-Color Red Plaid Lanyards. Please check our online lanyard catalog for more information. 9. Custom Imprinting: On top of pre-printed red plaid lanyards ( as back ground colors), any customized or personalized logo imprinting available - by way of silk screen imprint. 10. Applications: Used as red plaid neck lanyards or red plaid wrist lanyards. Good for Personal Use or for Scottish or Irish gift shops, resellers, wholesalers, distributors, kids party, out door adventure, fundraisers, event fundraising or promotional giveaway gifts. 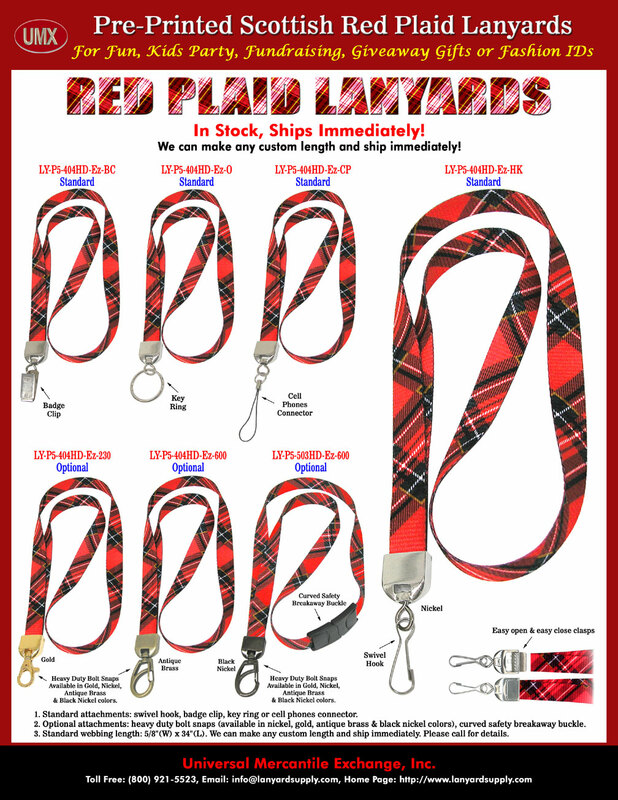 You are viewing > Lanyards > Ez-Adjustable Neck Wear Models > Scottish or Irish Red Tartan Lanyard with Cool Red Tartan Plaid, Kilt or Scotland Highlander Theme - Tartan Supply. A Great Lanyard Source For Tartan Store or Plaid Gift Shop.